Mark Oshiro is the Hugo-nominated writer of the online Mark Does Stuff universe (Mark Reads and Mark Watches), where they analyze book and TV series. They were the nonfiction editor of Queers Destroy Science Fiction! and the co-editor of Speculative Fiction 2015, and are the President of the Con or Bust Board of Directors. When not writing/recording reviews or editing, Oshiro engages in social activism online and offline. Anger is a Gift is their debut YA contemporary fiction novel. “This debut novel provides a riveting, devastatingly realistic portrayal of the criminalization of marginalized groups and an unwavering examination of the lasting impact of bigotry. 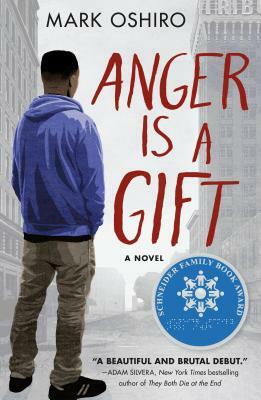 His teenage characters have authentic intersectional depth and are developed beyond the various ways society labels them: black, Latinx, disabled, Muslim, asexual, nonbinary, gay, lesbian…the narrative is compelling, providing a new and noteworthy account that continues the conversation and depiction of society's opposition to otherness. This is not to be missed and should be placed in a prominent position in every library serving teens.”— Voya, Jewel Davis.